Many boat owners in Santa Cruz Harbor are still waiting to get their boats surveyed and repaired from damage caused by the March 11 tsunami in California. With so many Santa Cruz boaters needing to assess damage and fix their boats, there aren&apos;t enough resources on Monterey Bay to pull all of the boats out of the water and make repairs, the Santa Cruz Sentinel reported. Of about 1,000 boats in the harbor, about 100 of them were “pretty mangled” during the tidal surges from the March 11 tsunami, Rodgers said. “We have to do insurance claims in a timely fashion, but I can&apos;t get the estimates quickly from the boatyards that do the repairs,” he added. Tom McKervey, general manager at Aquarius Boat Works in Santa Cruz, said the business has hired two workers since the tsunami to manage the extra workload and still must prioritize about 90 boats that are waiting to be hauled out. The yard has a capacity of about 16 boats and it averages about 1.3 boat inspections a day, he said. 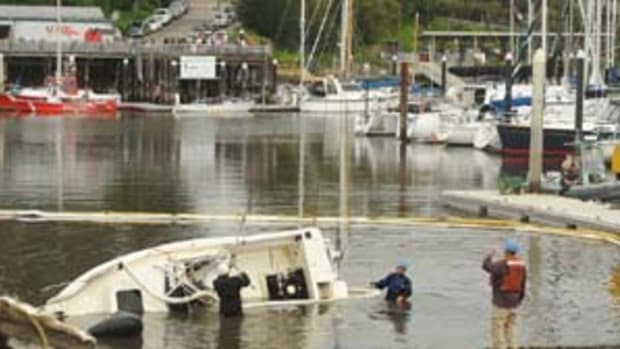 The tsunami caused $28.5 million in damage to the harbor, including damage to docks, Eisenstar said.